Winds of change are blowing across the nation. After a recent market slump, supportive policies and cost declines are driving growth in the wind energy sector, and bringing billions of dollars in economic benefits to states throughout the U.S. The American wind fleet closed 2016 with 82,183 megawatts of cumulative installed capacity, enough to power 24 million average American homes, according to a new report released by the American Energy Wind Association (AWEA) in partnership with Navigant Consulting. 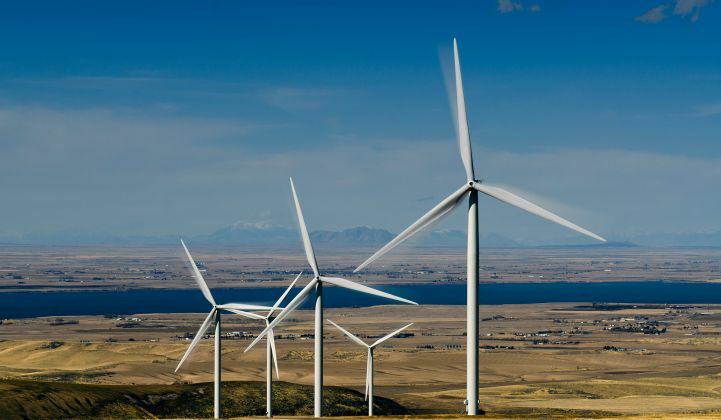 Over the next four years, the wind industry is expected to add another 35,000 megawatts of capacity, and drive $85 billion in economic activity through investments in new wind projects, manufacturing, construction and operations expenditures, and tax payments. 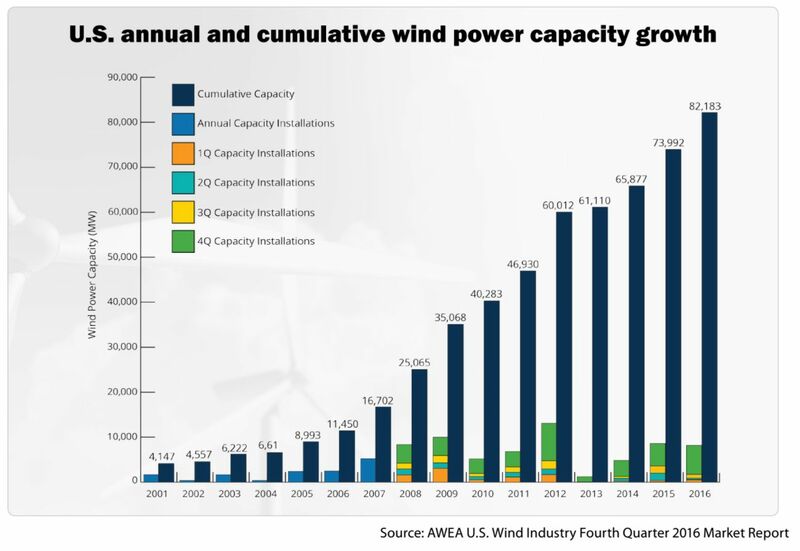 Here are five graphics that show how the U.S. wind sector is building momentum. The number of wind industry jobs grew by nearly 17 percent to 102,500 jobs in 2016, and will continue to increase in 2017. According to the AWEA/Navigant report, the U.S. wind industry could see a total of 248,000 jobs by 2020. 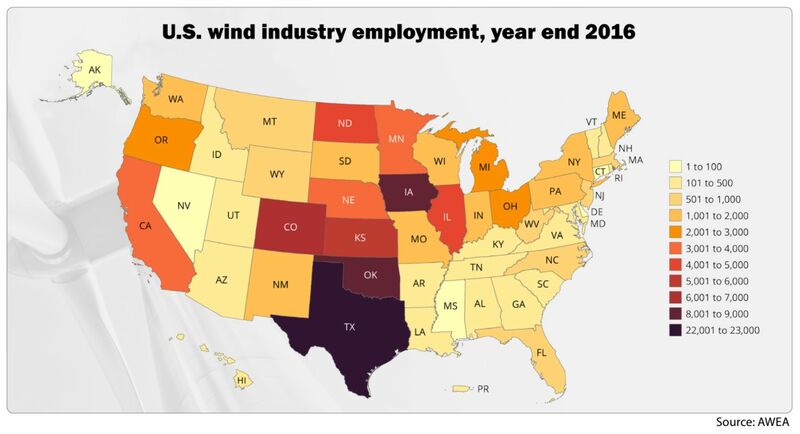 Of this amount, 33,000 Americans are forecast to work in factories supplying components to the wind industry; 114,000 in building, operating and maintaining wind turbines; and an additional 102,000 workers in jobs induced by the wind sector’s economic activity. The U.S. currently has more than 500 wind-related manufacturing facilities across 43 states making wind turbine components such as nacelles, blades, towers and gearboxes, as well as internal components like bearings, slip rings, fasteners and power converters. More than 25,000 employees worked in wind manufacturing last year. Wind project development isn’t only creating jobs -- it’s also supporting states and local communities through sales, plus income and property taxes. Navigant estimates that new wind projects built over the next four years will provide a cumulative $8 billion in tax revenues. Virtually all (99 percent) of U.S. wind projects are located on private lands in rural areas, delivering more than $245 million in landowner payments to local farmers and ranchers each year. Approximately 71 percent of this development is located in low-income communities. Wind is often the largest source of county tax revenue, which is commonly used for community development in the form of schools, libraries and hospitals. 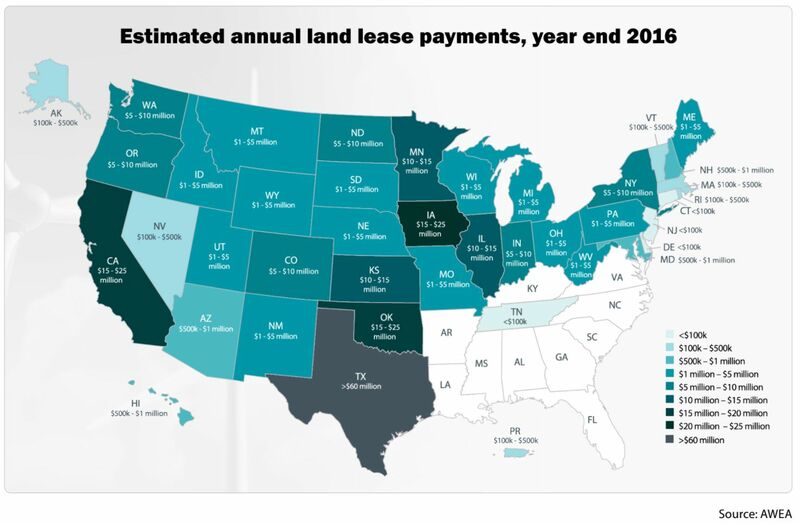 Landowners in Texas, Iowa, Oklahoma, California, Kansas, Illinois and Minnesota currently receive annual land-lease payments in excess of $10 million, according to Navigant. Annual land-lease payments exceed $1 million in 27 states. The AWEA calls wind a new “cash crop” for farmers and ranchers who lease small portions of their land for wind project development, while retaining the rest for agricultural use. Wind is welcome across America “because it means jobs, investment and a better tomorrow for rural communities,” said AWEA CEO Tom Kiernan, in a recent statement. In a separate data set, the U.S. Energy Information Administration (EIA) found 8,727 megawatts of new wind capacity were installed in 2016, allowing wind to surpass hydropower to become the largest clean energy source in America. According to the EIA, wind turbines operating in 40 states generated a record total of 226 million megawatt-hours in 2016, approximately four times the amount of solar electricity produced the same year. Texas is the largest source of wind energy in the nation, with approximately three times more wind-generating capacity than any other state and nearly a quarter of American wind jobs, as per a report released by AWEA last month. 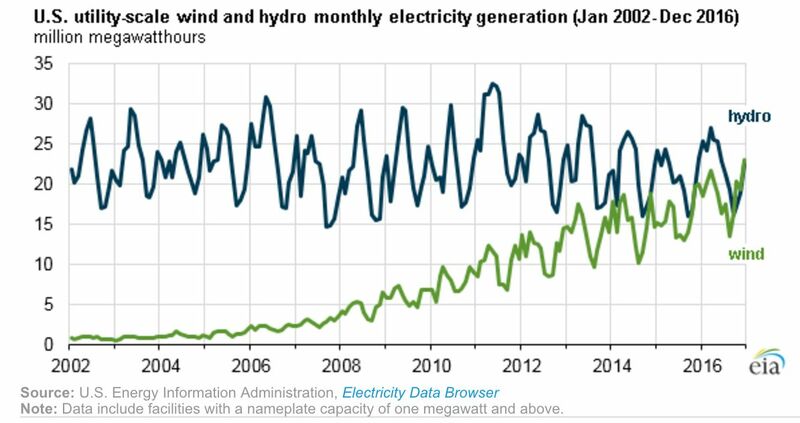 However, given hydroelectric power’s higher average capacity factor and above-normal precipitation on the West Coast of the U.S. this year, hydro generation will likely exceed wind generation again in 2017, despite strong growth in the wind energy sector, according to the EIA. Looking at the broader energy landscape, wind power generated more than 5.5 percent of all electricity across the U.S. last year, according to EIA data. While Texas is the leader in wind power, Iowa recently became the first state to generate more than 35 percent of its electricity from wind, reaching 36.6 percent in 2016, according to the AWEA/Navigant report. 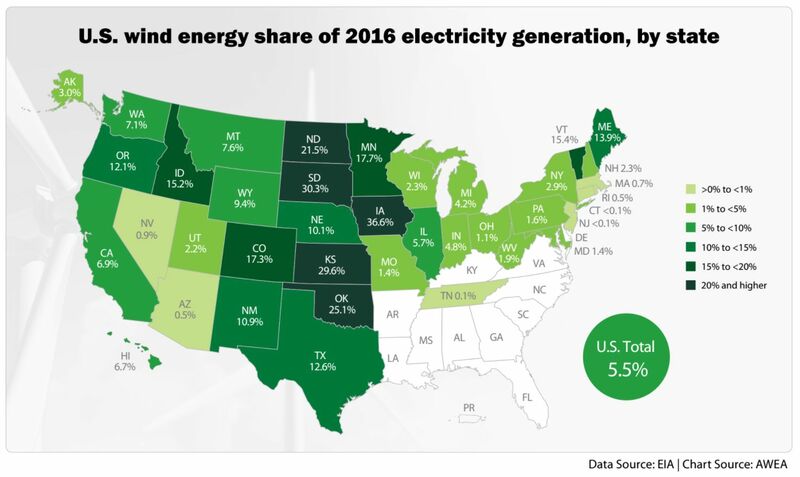 South Dakota followed Iowa at more than 30 percent wind energy, while Kansas, Oklahoma and North Dakota all produced more than 20 percent of their electricity from wind power. In 2016, 14 states generated more than 10 percent of their electricity from wind. AWEA says America’s grid operators have expressed confidence that they are ready for further expansion of wind power, and that the Eastern Interconnection, the electricity grid encompassing most of the Eastern U.S., could reliably and affordably obtain 30 percent of its electricity from wind and solar within the next 10 years using today’s technology and tools. 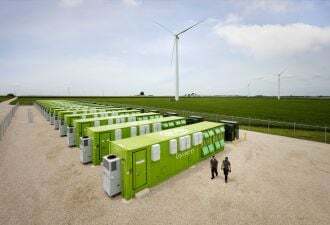 The wind industry continues to expand its presence in large part thanks to technological advances that are opening up sites for wind project investment that were not previously viable. In early 2017, the first utility-scale wind project came on-line in North Carolina, expanding the U.S. wind industry’s footprint to 41 states. What’s more, applications to build wind projects are pending in nearly all of the states that do not currently host wind, according to AWEA. In addition, new opportunities are opening up for offshore wind -- an industry that is sizable in Europe but has yet to gain a foothold in the U.S. The commissioning of the 30-megawatt Block Island Wind Farm off the coast of Rhode Island in 2016 marked the launch of the offshore sector in the U.S. The overall offshore wind resource potential in the U.S. is estimated to be four times the generating capacity of the entire U.S. electricity grid, according to the Bureau of Ocean Energy Management (BOEM). There are offshore wind projects currently in various stages of development off the East and West Coasts, as well as Great Lakes coasts, and several of these projects could come on-line before 2030. Last week, BOEM announced it is moving the offshore leasing process forward for several unsolicited requests from companies looking to develop wind projects off the shores of New York and Massachusetts. “America has a world-class wind resource far off our shores that is attracting the investment of a billion-dollar energy industry that currently supports over 85,000 jobs overseas,” said Collin O’Mara, president and CEO of the National Wildlife Federation, in a statement. O’Mara said BOEM’s latest announcement is “a clear sign of momentum in the Northeast,” where there is a visible market of over 4,000 megawatts of offshore wind. “Responsibly developed offshore wind power is America’s golden opportunity to create tens of thousands of well-paying jobs, while providing pollution-free power right where it’s needed and avoiding wildlife impacts,” he said.